It was just before Thanksgiving when we told you about a problem the 2018 Apple iPad Pro models have with the bends. Owners of Apple's latest high-end slates started complaining about a bend in the device after they were carried in a backpack; others say that their expensive tablet came bent right out of the box. Apple said that this was merely a result of the manufacturing process, and that it will not affect the performance of the product. Last month, Dan Riccio, Apple's VP of hardware engineering, wrote an email to a consumer who complained about the bend on his iPad Pro. The executive said that the "unibody design meets or exceeds all of Apple's high quality standards of design and precision manufacturing. We've carefully engineered it and every part of the manufacturing process is precisely measured and controlled." Now, Apple has added a new support page that explains how the iPad Pro is manufactured (via The Verge). The company notes that the new iPad Pro models use a strong, light and durable aluminum. Instead of curved edges, the new models have a rectangular design that uses straight edges. In addition, the cellular versions of the tablet have "splits" in the side to allow parts of the enclosure to be used as an antenna. Apple says that the "precision manufacturing techniques" that it uses help the iPad Pro meet tighter specs than previous generations of the tablet. The flatness specs for the tablet mean that any side of a cellular 2018 iPad Pro cannot deviate by more than 400 microns, which is less than the thickness of four sheets of paper. 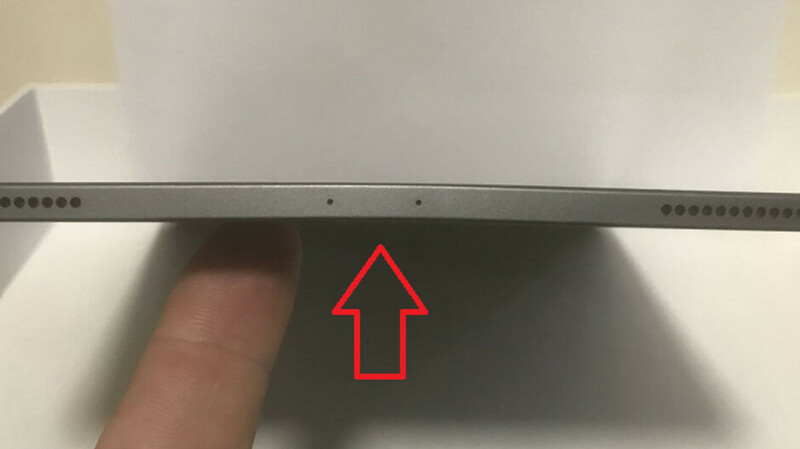 Apple says that the use of the straight edges and the antenna splits could make "subtle deviations in flatness" visible from certain viewing angles. These deviations cannot be seen during normal use. On the support page, Apple repeats the claim that the "subtle deviation" won't get worse over time, and will not affect the tablet's performance. "iPad Pro cellular models now feature Gigabit-class LTE, with support for more cellular bands than any other tablet. To provide optimal cellular performance, small vertical bands or “splits” in the sides of the iPad allow parts of the enclosure to function as cellular antennas. For the first time ever on an iPad, these bands are manufactured using a process called co-molding. In this high-temperature process, plastic is injected into precisely milled channels in the aluminum enclosure where it bonds to micro-pores in the aluminum surface. After the plastic cools, the entire enclosure is finished with a precision CNC machining operation, yielding a seamless integration of plastic and aluminum into a single, strong enclosure. If someone does own a 2018 iPad Pro with a bend that exceeds Apple's acceptable specifications, the company suggests that they go to the Apple Support website. Tablets purchased directly from Apple can be returned within 14 days of purchase, and a one-year warranty covers "damages from defects in materials and workmanship." Make the next model stronger. I went with the 10.5 pro once all this came about. I really wanted to buy the pro model his year but after all this nonsense, I am waiting and hoping next year everything will be fixed. Or just buy a used slightly bent one, put a nice case on it, save dollars. How about the people who will not buy the next model? Apple is getting spoiled already with that pattern. If you bought the bent ipad, don't complain and buy the next model, they just made double profit out of the same person they're duping with. Gaming communities are getting tired of half-baked games from EA and their sales are suffering now, make apple know that you are not gullible on everything they do. I feel Apple should just accept replacements for any bent iPad irrespective of the 400 micron level. These statements are just making it very awkward. Of course only replace in warranty period but thats the least Apple needs to do for such costly products. They won't accept replacements because almost all the ipads made are weak that bends. You can return it within 14-days period. They differ depending where you bought it from though. In other words the frame is too thin and light, no thank you. Wow, an expensive tablet where the manufacturer don't admit that they made a bending design mistake. Where's the premium on their part? Now I think apple really deserve to get sued by the people who bought them. Give apple legal headache, ipad buyers. You don't deserve to get fooled around if you spend $700+ on a device that should be in perfect condition out of the box. Get sued for what? You have a period of time in which you are free to return the product and get your money back; if you failed to do that (unless you prove you couln't have done it), it means you have accepted the product and the manufacturer (no matter who it is) is only bound to repair the product if it fail (or replace it under certain conditions). You are taking it as a guy watching this type of stuff, you have to imagine average costomer, an idiot if you will, for them this a definition of hidden design flaw. Most of them will find out first time they travel with their new iBend Pro. Stupidity is never an excuse. This is a visible flaw even the dumbest customer is able to notice (and the ones that don’t are not affected by it).
" antenna splits" LMFAO, yeah right WOW , apple will make any excuse to not admit they F-ed up. " Tablets purchased directly from Apple can be returned within 14 days of purchase" So if you bought it at Bestbuy your screwed. "precision manufacturing techniques" " and " thaughest glass ever" are among my favourites. This is yet another cop-out by Apple, they should recall the iPad, fix the problem and come out with a stronger iPad. It is obvious that it is too thin and there are weaknesses in the centre of the longer edges. I do not live in the US and a friend bought an iPad for his son for Xmas, when opened on Xmas day it was bent, so much so it wobbled on the table. The seller (Apple Authorised) refused to replace it, saying it was misused. This is typical of Apple service and their repeated denial of problems that are clearly their fault, whether the design or manufacturing defects. Isn't that a design flow why are they making it look like a special feature !? LoL! “These deviations cannot be seen during normal use.” Backs up my claim you’re looking at it wrong. Hahahahahahahahaha apple relies on it's true fans being complete gullible fools. Next year this will be reinforced which essentially admits this is not at all acceptable. Just more excuses. What's the purpose of all these "rigorous testing and strict standards" if you can see them with your naked eye? I get that the bend doesn't affect any performance or functionality of the iPad pro but this is just straight up wrong cosidering the price you pay for these. Is it really "that" hard to make a sturdier iPad? The very people who hate Apple and will probably never buy their devices are having orgasims at their problems. Is Samsung and Google not satisfying you guys enough sexually? The way you people act makes it seem like you want Apple and all its users removed from the face of the planet... But what would you guys do if that happened? You've spent the last decade hating on Apple and climaxing on their issues.. How would you survive without that? It truly is one of life's greatest mysteries as to why Phone Arena attracts the lowest form of degenerates who think they are better than others just because they use a different mobile OS. So all it takes to wake up and become a genius is to buy an Android device eh? 50 bucks to buy a base Android and baam you are among the greatest? But using an iPhone and going about your life, spending time with your family and friends.. and you are some brainwashed zombie? Why are you so emotional? Stop crying, you also need to tell apple fans the same about bashing android fans for years as well. Oh I don't know, maybe because this place is infested with toxic fandroid people? Ever thought about that? I love to discuss tech and phone arena was once a place where such existed but now thanks to your kind, it's been ruined. Trolls on both sides are equally guilty, but fandroids take toxicity to another level. The "only smart people use Android bias" is such utter trash, I am amazed at how anyone can ever fool themselves into believing such. So what 50 bucks buys you intelligence and you wake up from the matrix? Because you can get an Android for 50 bucks. I don't even use iOS anymore, I'm on Android, makes no difference to me if Apple is insulted or going down in flames but the way fandroids insult regular people out there (who couldn't care less about specs) and act like they are superior, yeah that I have a problem with. Either way, even the fandroids know inside how full of crap they are and are just insecure jealous kids. Once again, never understood how Phone Arena attracted such a horrid crowd. You can always leave, there are many other sites. Oh, you don't even have to read the comment section either. Sounds like your making yourself uncomfortable. They are both very toxic on this website yet you are triggered only by android fans? Doesn't make sense. All of what you said is also vice-versa with apple fans. Looks like you are a little one sided. Just because you "use android" doesn't help with your justification. Anyways, I didn't say your points were wrong, it just applies to both sides bro. Don't let that get to your head, you don't need that unnecessary stress. Yeah I guess you are right, the comments section here is just too toxic and not worth it anymore, such a shame, this has been my favorite site for years. I barely comment now, just not worth it anymore and when I do it's usually just to comment on the ironic contracting logic of the fandroids. Starting to wear thin so I guess I'll just stop. Great work fandroids, continue to ruin and drive this community into the ground. Good job, Android is surly the greatest thing that's ever happened and you alone are worthy of existing.. Only because you bought an Android. Also can you honestly say that the fandroids aren't more toxic than the Apple fans? It's almost like the Apple fans say things just to trigger fandroids whereas fandroids truly believe they are some sort of superior race.